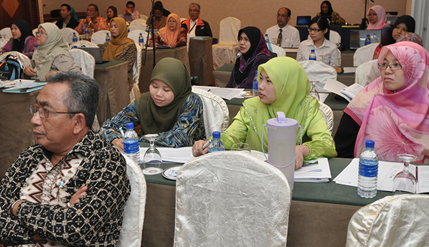 BANGI, 22 Nov, 2012 – for The National University of Malaysia (UKM) is to set up an Office of Sustainability Development by 2015 or earlier to plan development within its campus here to reduce the possibility of natural disasters there. 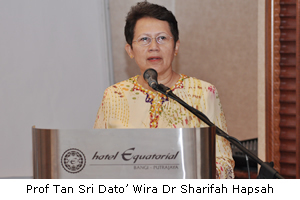 UKM Vice-Chancellor Professor Tan Sri Dato’ Wira Dr Sharifah Hapsah Syed Hasan Shahabudin said the setting up such an office is even more urgent in the light of recent incidents caused by heavy downpours and floods in the campus. She acknowledged that many buildings and structures erected earlier might not be suited to the hilly land occupied by the campus. Launching a two-day Seminar and Workshop on a Sustainable Campus 2020 here today, she said flash floods and landslides which occurred in the campus ground were partly due to earlier planning which had not taken into account the natural surroundings. She was referring to flash floods and the collapse of a 200-metre long covered walk-way at a parking lot adjacent to the Tun Abdul Razak Hall (Dectar) when a tree was uprooted in the campus following a heavy downpour. About 25 cars were damaged in the incident even though there were no casualties. Several buildings in the campus had also to be evacuated temporarily when flood waters brought in mud. The UKM Sustainable Development Research Group which organised the seminar and workshop, had proposed that UKM set up the office of sustainable development to look into future development of the campus grounds. Prof Sharifah Hapsah said it is high time that construction be environmental-friendly with as little damage done to the land as possible. She noticed that some hills in the UKM “Green Campus” have been badly eroded and denuded of vegetation. She directed that the Institute of Environment and Development (LESTARI) submit a working paper to the Chancellery by the end of the year so that she can seek approval for the proposal from the government. 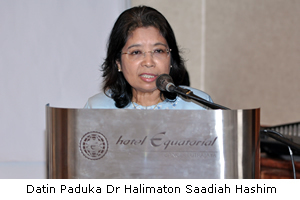 Earlier, the Head of the UKM Sustainable Development Research Group, Datin Paduka Dr Halimaton Saadiah Hashim, in her opening remarks, suggested that the office be made up of five sections. a. Tree Management to determine which trees can be cut down or kept. b. Geology to find out whether certain terrain can support a planned structure to be built on it. c. Asset management for the maintenance and supervision of buildings and structures. d. Building Forensics for determining whether a building is in danger of damage due to soil erosion and weather. e. Disaster Risk Evaluation Group to observe whether any part of the campus faces risks caused by heavy rains and storms. Dr Halimaton said the need for setting the office was becoming more urgent and should not be put off. She had carried out a study of several campuses at home and abroad which had formed their own departments devoted to the preservation of the natural environment which have large buildings. Any new plan for construction in those universities would be scrutinised for their environmental sustainability before implementation.